It is time to do less… Sit and soak up all the energy all around you. Let things play out effortlessly. This cosmic gazer teaches us how to reduce the amount of physical effort we are exerting and find the easy path. It is time to sit and soak up all the energy all around you and let things play out effortlessly. All that is, be it a house, a book, a song… etc, was an energetic vision before shifting into the physical world. In our industry obsessed culture ‘easy’ has been equated with ‘lazy.’ But Lizard asks if we are deliberately complicating something in order to earn our right to enjoy it. If this medicine is in your life, put down the tools and visualize. Lull and daydream an easy grace into your task and let the energy of the day carry some of the work for you. Lulling is a state of warm cozy mental rapture that uses energy from the surrounding environment to carry you into dimensions beyond the Third. When we lull our minds beyond the Third dimension, we find new, indirect solutions to the situation at hand. In his lulling, lizard pulls life to him with a quantum understanding of design and manifestation. His medicine reminds us that you are the dreamer of your life and life is the dream you create with the power of your attention. You chose what you focus on. If you feel gripped by an obsessive cycle of thoughts, it is time to roll the eyes about and enter the no-think zone. Lizard lives in the Dreamtime, a place where nothing is what it seems. He keeps himself grounded with the basic elements of the ground itself- rocks. This hot desert medicine is inseparable from the spirit medicine of Rock. As a reptile, Lizard is not able to generate his own inner heat. He uses the warmed surface of rock to access the power of the Sun and fill him with life energy. When you are feeling drained, it may be time to find a simple stone to wear or hold in your pocket to anchor you to your day. Rocks are the ultimate reality check. They are the basic raw material from which ALL physical life springs. The variety of stones, crystals, and gems found on this planet are an artistic expression of ancient frozen light from dimensions beyond our gravitational perception on Earth. Rocks are cosmic. They’re what the 60’s would call ‘far out.’ Even though humans have classified and analyzed the atomic structure of every element on Earth’s surface and placed it into the Periodic Table of Elements, the deep cosmic ability of rocks to absorb and neutralize energy is impossible to grasp with everyday logic. To talk to rocks you must trance out. And Lizard’s logic knows the way. The solid rock he is basking on is comprised of atoms which, it turns out, are comprised of ’empty’ space of vibrating potential fields. After smashing rocks down to the last atom, we figured out how to smash that atom and have a look inside. Within the atom there is a very bazaar world of ‘no thing’ with lots of potential. That solid rock Lizard is sitting on is made of insubstantial ’empty’ potential. And that is the essence of his medicine. When your daily life has become a frustration, Lizard suggests that you reconnect to your inherent empty state where potential for change is eternally undefined. All rocks and obstacles are in reality, magic carpets that can take you anywhere you can think to go. If Lizard medicine appears in your life it may be time to let your environment help out. It may be time to sit in the Sun and make some vitamin D. In seclusion, you may have lost touch with the fundamental mechanics of energy exchange. Have you forgotten that you are steering the vehicle of your life and that you can go wherever you want to? This medicine holds the power of vast abstraction. He is not a contemplative energy and does not engage in too much intellectualizing. Lizard enjoys the endless unfolding of new questions as the ultimate experience of life and he also understands that the answers to those questions are very often nonverbal experience of colors, textures, temperatures, and pressures outside our logical thinking. He takes even the strangest events at face value and doesn’t get hung up on exacting logical answers out of life’s mystery. Like smashing the atom, the questions of why will lead us through complex reasons to the vanishing final answer of ‘because.’ Lizard enjoys the process of asking questions but he understands that answers only lead to more questions and it is your questioning mind that expands the universe. We live in the third dimension and we have five senses with which to experience life. But sometimes the answers we are seeking are just outside our capacity of perception in dimensions above and below the 3rd. How do we access that new space? How do we open to new concepts beyond our limited understanding? How did that little shrew creature shift itself into the hominid reading this blog? The journey of evolution is shamanic. Have you ever paused to observe a tiny creature and, in so doing, gained a sense of your own largeness? Lizard invites you to imagine yourself as the tiny creature and reach your awareness towards that looming larger witness beyond your own perceptions. It is there. Life is always pushing the edge between the solid and the immaterial, the horizon line of consciousness. And as you reach for new comprehensions, you shape the evolution of human capabilities. That is how important you are. There is no inquiry too small or unimportant to explore. Whatever your interests, you expand the cosmos with your investigations. How does the notion of other dimensions strike you? Does it make you nervous or intrigued? The horizon line of exploration can go in any direction since you are the one expanding it. The tone with which you explore the unknown will determine exactly what you will find. If you are fearful you will find frightening dimensions. If you are adventurous you will find adventure. It is you who determines the quality of your experience since all the world bends to your specifications whether you are aware of your power or not. If you find this notion a bit difficult to agree with, ask yourself which reality you’d rather live in; one in which you affect and create reality with power of your preferences? Or one where reality is determined for you regardless of what you want by an incomprehensible external force? Both realities exist as an option for you to live in because ultimately the first option, (free will) is the Law of life enabling the limited second reality. Lizard has one eye on his target and one eye in the cosmos. He knows that today’s mysterious magic is tomorrows science as we increase our ability to perceive deeper and deeper into the cosmos. If Lizard has visited your day you may be looking at something too practically and missing its magical capacities. Lizard says, roll your vision around a bit and find the inherent strangeness of what is before you. There is always more you do not know. Confidence is not based in “knowing’ all the data. It is based in a trust that you will find what you need as you need it. Lizards, on their warm rocks live in the lulling realms and advise total relaxation when questing for answers. People with Lizard medicine often enter trance states of thinking without knowing it and then later find that what they were contemplating has come directly to them. This is the power of lulling, a mental form of manifesting desires. Lulling is a multi-dimensional experience of daydreaming. It is often marked by a high, ‘sweet’ sensation of spinning in the mind where thoughts and ideas scroll and flow with intense pleasure. It is also possible to lull in the negative, in which case you swirl yourself into scary scenarios. If you persist in negative lulling you will eventually draw those situations into your life. The concepts of lulling can be observed in Lizards unusual gaze at life. 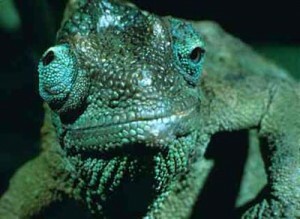 Lizards have very agile eyes that can roll around independently of the other with great precision and range of angles. He is able to keep his sights on practical matters while also gazing into the abstract mysteries. Stretching the optical nerve of your own eyes by circling the eyes round can help clear the limited structure of current thoughts and change your brain chemistry. Since the eyes are hardwired directly into the brain, what you look at is what you will experience so shift your gaze if you are unhappy. The fiction writer, Annie Dillard once wrote that every child should have the right to sit and stare off into space. Lizard medicine agrees. Gazing off into space is how the creative spirit streams into our body. It is how we process and heal. Not all productivity occurs above ground in a visible, measurable way. Much, if not most of our efforts occur in a space just beyond our brains ability to itemize. Evolution and creativity are not efficient processes. We can not make a bee-line path to improvement or productivity. We often have to meander and circle wide around our chosen goal in order to reach it. When living in the world of linear time that can become a painful frustration as we fear we will not have enough time to make it to the finish. But Lizard Spirit Medicine does not live in linear time and he knows that linear time is in truth, contained within the infinity of cyclical time. Like asthma, feeling like there is not enough time can suffocate our ambition. But there is plenty of oxygen to breath and there is plenty of time to take the small steps towards what we want. Releasing the need for accurate, timely performance can often enable a spontaneous event of perfect timing. Evolution and creativity are not particularly accurate sciences. But when you have all the time in the universe, you are guaranteed to strike a successful combination. Lizard medicine is an invitation into all that time. On the other hand, Lizard medicine in the reversed flow could signal a time of too much abstraction. Philosophical inquiry must also have occasional picnics in simple, unexamined activities. When the pleasure and adventure of philosophy becomes a depressive torture, let go of that journey and eat some soup. It may be time to accept some basic premises of life and ease up on the questioning of it all. Cosmic contemplation is only possible from a real human body with blood and bones. Without your body you are not traveling through other worlds, you become a permanent (i.e. insubstancial) resident there. So eat vegetables, find a rock to hold in your hand and never loose touch with the sensations of your body. It is how you experience all this wonder. People who carry Lizard medicine often have friends who are nothing at all like them. They find companions who do not engage in too much contemplation and who are able to keep things in perspective. In this way, friends, with their unrelated and simple perspectives become our grounding rocks. In health, Lizard has much to say about the practical side of getting a good nights sleep. The phenomenon of sleep is visual proof that we are spiritual beings having a physical experience. Physical life is a tremendous challenge. It is so difficult that we can not sustain physical form for more than 36 hours at a time without spontaneously leaving our bodies. Lizard asks you to consider who is it, exactly who ‘leaves’ the body? Whoever it is, that is your truest form self beyond psychology. We meet that self every night and that meeting is a sensation of ultimate satisfaction. There are two distinct stages to sleep: the dream state and the non-dream state. The non-dream state is the most restorative. It is the God consciousness state of profound peace that rejuvenates the goals and tactics of our singular Earth self. The dream state is the mental chamber we must travel through to get to that God place. There are two kinds of dreams: the personal dream and the Universal dream. Personal dreams are the art box of our brains as we evaluate and reshapes all our daily experiences. The Universal dream is a river into higher consciousness. Personal dreams are the most common occurrences. They come from the closed system of our unique mental content as determined by the conditions of our childhood and daily environment. It is important to understand the ‘closed system’ nature of personal dreams. These private dreams do not engage the outside world and, regardless of what horror movies say, the outside world can not reach us through personal dreaming. Personal dreams are all based on our own individual personal psychology. In a personal dream if I dream of another person, I am actually dreaming of another aspect of myself. I am not receiving the other person’s actual energy. I am only interacting with my limited understanding of them or using them as a symbol to express a larger concept. The contents of Personal dreams are also directly related to the images and sounds we expose ourselves to during waking hours. This may not be immediately apparent since there is often a week or more delay and a distortion of how materials reappear to us in dreaming. Personal dreams are exacting gauges that express your true feelings. It is an inherent opportunity for self therapy . Discussing your dreams with others can help you interpret their abstract symbolism which is personal to you. But to discover a dream’s meaning you must be willing to admit uncomfortable thoughts and feelings. So how do we know if we are having a Personal dream or a Universal dream? A Universal dream will be marked by a distinct sensation of love and joy and it brings a tingling new sense of clarity from a larger source. Universal dreams are open system dreams into the cosmic mystery where the powers of the outside realms can reach and affect us. In a Universal dream, if you dream of another person you are in direct connection with their spirit energy and are being guided from above. This is a shamanic dream state and it is an invitation into the arts of deeper comprehension. There will never be any hint of doubt, nervousness, or pain in a Universal dream since the law of the Universe is Love. Often such dreams will have animals who will talk and guide the sensations. Such dreams happen maybe once or twice in a lifetime. But it is possible to experience more Universal dreams when you decide to follow the path towards Shamanic arts. Everyone on Earth has the potential to be a shamanic healer. That takes the willingness to release the logic and priorities of daily life. Nightmares are Personal dreams that indicate a psychological resistance or block to change and growth. Since all outside energy from the cosmos is made of pure light and love, it is not possible for any malicious external energy to cause your harm. Nightmares never ever come from the Universal realm because the Universal realm is only loving and can not cause pain. Malicious intent is only possible through a willing psychological agreement with that fearful situation. The pain you feel in a nightmare is due to the limitations of your psychology and your reluctance to examen an aspect of your life. These dreams are closed-system dreams of extreem resistance to change and are indications that you need to accept your true feelings of a situation without dictating how you think you ought to feel. If you suffer nightmares the first step is to improve the sphere of influence you expose yourself to. Watching or reading about violence late at night will feed directly into the source material your brain uses to construct dreams. Television and popular literature is mostly comprised of outrageous and unlikely violence. Your imagination does not care about what is ‘real’ or true. To the imagination, everything is real and true. Another aspect to gaining restful sleep is in the preparation for it. In times past, the setting sun brought a darkness that was impossible to engage. We all got very still. Darkenss forced people to stop what they were doing and shift into altered states. Drumming and cosmic travel were the business of night. These days we must turn lights off for ourselves to delineate day from night. Insomnia often arrises when someone has not used all their life energy during the day and who is not yet satisfied with their daylight activities. If it is hard to get to sleep at night Lizard asks you to consider making a major life change, one that will bring you deeper daily satisfaction. It may be time to exercise a bit more rigorously and reach physical fatigue. Spend your days engaging your soul on a profound level so that at the end of the day you feel consumed by a job well-done. But keep in mind that arriving at a sense of a job well-done could very well mean legalizing your right to not work at all for a while. When work becomes a means by which to prove your worth to the world, Lizard reminds us that just being at peace in the light of the sun can have more productive value to the planet than all the corporate business strategies in the world. Lulling is very practical. Peace is very practical. It is also common to develop a habit of engaging in mental concentration all the way up to the very brink of exhaustion letting the book or remote fall out of your hand and letting the T.V. flash and chat at you throughout the night. Lizard medicine advises that you turn off all technology at least one hour before going to sleep to condition your body into the still nature of sleep. We must release our goals every night whether we want to or not and return to a simple state of stillness. Entering the stillness of the dream time willingly leads to a stronger, healthier nervous system and lets your passions renew and reinvent themselves. Turn off the lights. Lie in bed and lull in the dark womb of Potential. Let yourself tingle into that powerful realm. The dream time is the well spring for inner answers. Ask a specific question just before you go to sleep, write it down, and watch the amazing process of discovery occur.